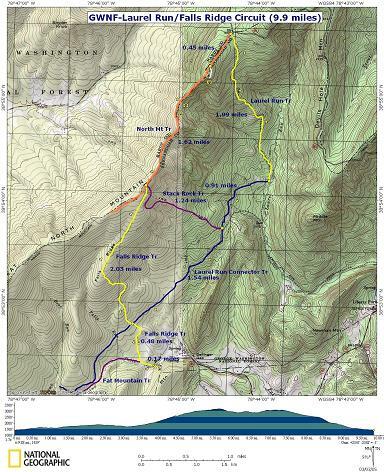 Description: This is a strenuous circuit hike with a 1600 foot elevation gain over 2 miles. It features great views to make up for 2.5 miles of forest road walking and the steep climb. In May the trails are lined with purple wild Flags and Pink Lady Slippers. 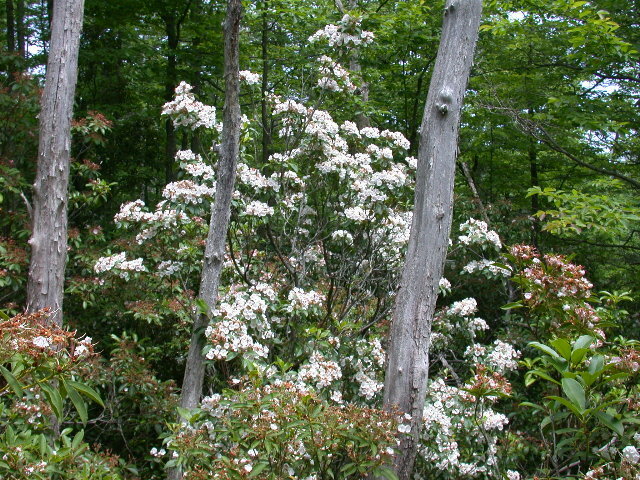 In June and early July Mountain Laurel and Rhododendron are prominent. Sweeping views of Long Mountain, Devil's Hole Mountain, Tibbet's Knob, Big Schloss and possibly even Massanutten Mountain on a clear day will make you linger on your rocky promontory. Continue on SR 701 (Dellinger Gap Rd), beyond the "End County Maintenance" sign, until it ends at the trailhead gate. Park on the left. 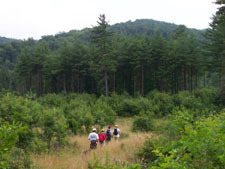 The North Mountain Trail is part of the Great Eastern Trail (GET). 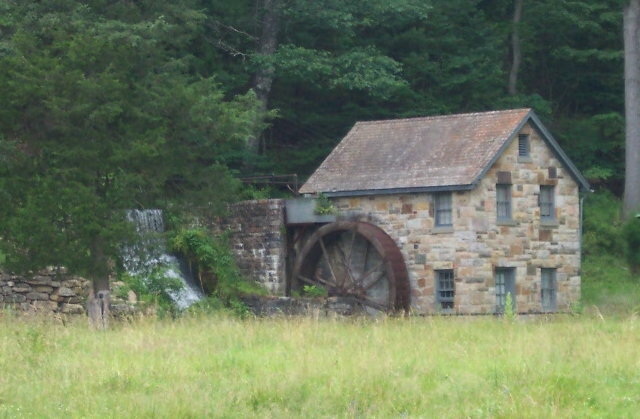 Trail Notes: From the parking area, cross Falls Run and pass the forest gate. Proceed up rocky yellow-blazed Falls Ridge Trail, through a pine tree plantation, to the intersection with purple-blazed Fat Mountain Trail on the left. Falls Ridge trail goes right for just a bit before turning North and uphill through a meadow. Blazes are absent through the meadow but in a short distance you'll find an old road with a fence row on the right. Yellow blazes resume here. Continue through second growth woods. At 0.7 miles from the beginning come to the intersection of blue-blazed Laurel Run Connector Trail on the left and right and the continuation of Falls Ridge Trail straight ahead. Turn right onto the Laurel Run connector. Pass the yellow forest gates. CAUTION: This is an active road at certain periods of the year. I've seen several turkey in this area so quietness as you proceed down the road may reward you with a sighting of this wary woodland fowl. In about 1.5 miles pass purple-blazed Stack Rocks Trail on your left. In about 1 more mile turn left onto yellow-blazed Laurel Run Trail. It starts off wide, flat and grassy. Soon you will pass another forest road on your right. The Forest service uses this road to apply lime to Laurel Run to control the pH and protect the fishery. This is a nice place to take a break before starting the climb. Shortly after passing this intersection the trail becomes steeper, rockier and more exposed to sun. Great views of Long and Devil's Hole Mountains are to your right. As the trees grow taller you may have to peek through them to get a better view. Purple wild flags line this trail in May. 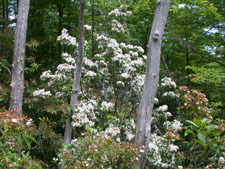 Mountain Laurel and Rhododendron manifest their brilliance in June and early July. Switchback through several stands of old growth woods and open wildlife clearings. You know you are close to the top when you come to a large flat rock blocking the trail. As you continue on you will notice the trail becomes soggy. At this point look for side trails to the left where you will find a grassy area complete with campsites and a small pond. You passed better water on your way up, a spring that crosses the trail. The Laurel Run Trail ends on SR 691 at a parking area. You've completed the majority of your climbing for the day. This is also the north terminus of the orange-blazed North Mountain trail. Proceed south along North Mt. 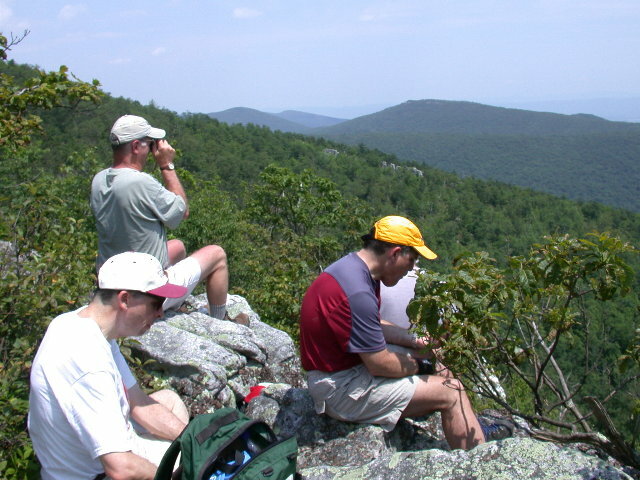 Trail as you climb gradually to the top of a knob. To the left is a white-blazed spur trail that will take you out to a nice ... but small ... overlook surrounded by pitch pines. There are great views here but the view to the left is partially blocked by the forest. If you wish to see more expansive views and/or you have a large group continue along the main trail. Descend into a slight saddle. In June you smell a sweet fragrance coming from the bushes around you. I don't yet know what it is. Spice bush? I suspected Old Man's Beard (AKA Fringe Tree) but couldn't find any. After walking through these bushes the ridge will suddenly narrow and plenty of rocks to your left will provide the crew with plenty of seating for the best view on the trail. 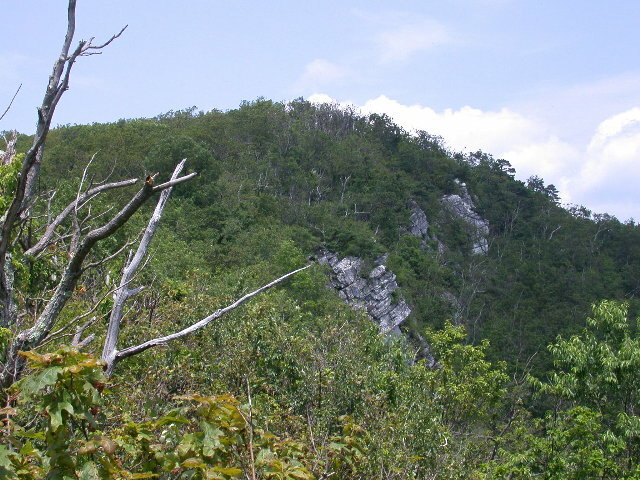 After taking in Devil's Hole Mountain, Tibbet's Knob, Long Mountain, Big Schloss (which is barely visible over Devil's Hole Mt), and possibly even Massanutten Mountain on a clear day continue south, down through another saddle and up to and through an open grassy area with more great views. You'll re-enter the woods as the mountain expands and climb gradually to the intersection of purple-blazed Stack Rocks Trail. Stay on the North Mountain Trail a little bit longer to the intersection with yellow-blazed Falls Ridge Trail on your Left. Decsend on Falls Ridge Trail, steeply at times, to FR 252 (AKA blue-blazed Laurel Run Connector Trail). Re-cross Laurel Run Connector/FR 252 and retrace your initial route back to the cars. Critique: After parking, Falls Run (little stream) is to the right of the single family home located at the end of the road. There is a trail to the left of the single family home which is not where you want to go. Beyond that, follow the provided directions and enjoy your outing. If you plan to backpack and camp, the last water stop, that is easy to access on the route, is just before the small pond (could be dry in late summer?). It's a little spring next to the trail. We filled up before the spring near the recommended break-point. After the break the trail climbs away from Laurel Run to SR691. 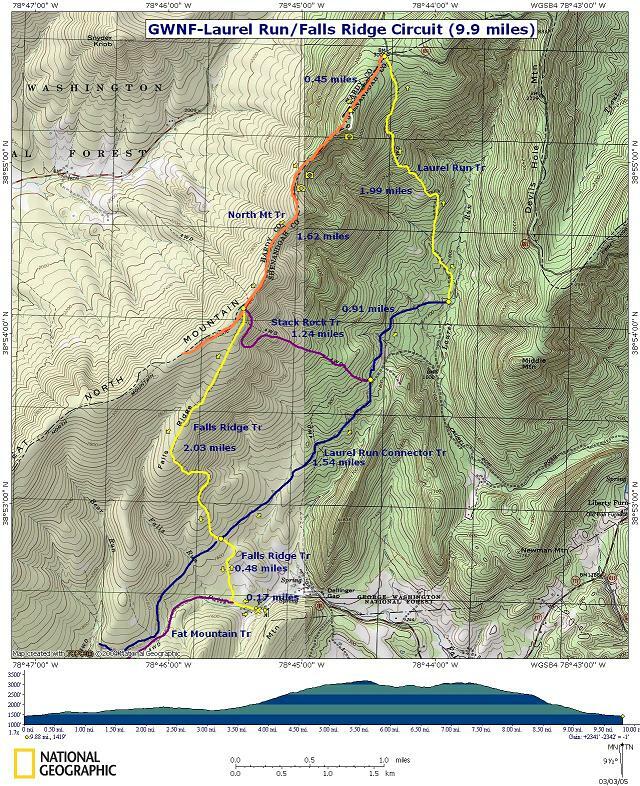 Critique: Trail: Nice strenuous hike, of 4-5 hours duration, with good views near top. Good boots mandatory, because of rocks, sometimes covered with leaves. Hunters out at this time. Ride to trailhead: First bridge on SR 675 functioning at this time. Do not take trail up to left from parking area, but walk forward on road for ~ 100 yds., and you'll see trail sign. Critique: Great hike! Quite arduous but worth the pain. Strongly recommend a walking stick because the entire trail is very rocky. The trail notes are a must have. Going up Laurel Run is very technical. Small rocks make long strides very difficult. The clear views are few but absolutely beautiful. 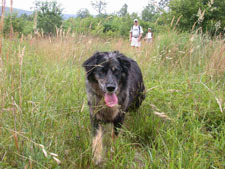 The trail is fairly overgrown which merely adds to the mystique of it. I didn't see a single person on my 4+ hour hike. The bridge at Columbia Furnace is out. Follow detours, Veer Right on 675 (at church right BEFORE Columbia Furnace- If you see a convenience store after you go over a bridge, you've gone too far), go down hill and make right onto SR 675. Stay on the North Mountain Trail a little bit longer to the intersection with yellow-blazed Falls Ridge Trail on your Left. Because the trail is so overgrown, the yellow-blazed trees can be hard to see. Look for rock piles.